This month I delivered Digital Humanities Second Library Lab, a hands-on showcase of digital library collections and tools created for the purpose of innovative research using computational methods. This three-hour session followed on from a previous event I ran in March and concludes a short run of events that form part of DH@Manchester. 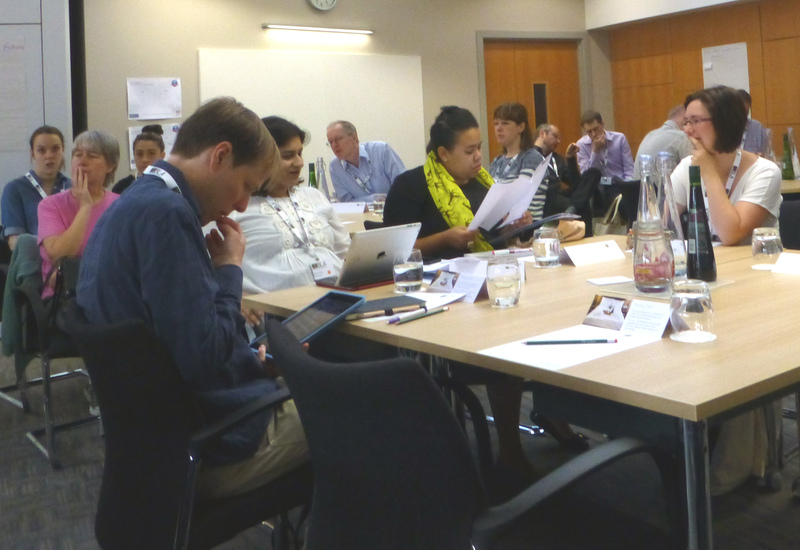 The aim of the workshop was to inspire researchers at all levels to gain practical experience with tools and techniques in order to go on to develop individual research projects with these or similar collections. Participants did not need any technical experience to join in, other than basic office and web browsing skills. The workshop plan and instructions are available online. What projects and collections did we look at? 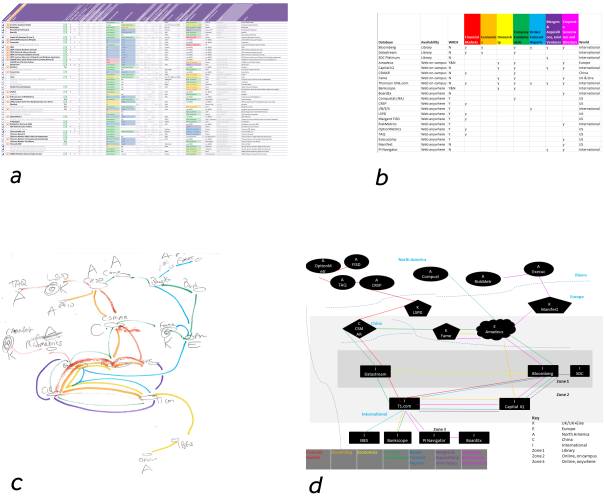 The three activities focused on image searching, analysing text and analysing colour. We looked at projects including the following. Broadside Ballads Online from the Bodleian Libraries (University of Oxford), a digital collection of English printed ballad-sheets from between the 16th and 20th centuries that includes a feature to search for an image within an image. The collection includes digitised ballad-sheets from The University of Manchester Library’s Special Collections following work by visiting researcher Dr Giles Bergel with the John Rylands Research Institute. JSTOR Text Analyzer from JSTOR Labs, a beta tool which will identify what any document you give it is about and recommend articles and chapters from JSTOR about the same topics. Robots Reading Vogue from Yale University Library’s Digital Humanities Lab, a collection of tools to interrogate the text within the entire U.S. Vogue Archive (ProQuest) and its front covers, such as a topic modeller, N-gram viewer and various colour analysis methods. While developing this workshop, I created a project of my own to visualise the average colour used in the front covers of all full-colour issues from Illustrated London News (Gale Cengage). Just a few short Python scripts were required to extract this information from the collection and display it in an interactive web page. This allowed us to look for trends with particular hues, such as the more common use of reds on December issues. Image analysis and computer vision has many potential applications with library collections, such as identifying where printed or handwritten text occurs in an image, facial recognition, and detecting patterns or differences between different editions or issues within a series. For image analysis systems to work best, the image sets and algorithms will need to be carefully curated and trained. This is a time-consuming process. The text analyser worked quite well but, as with the image search, was not perfect. It is important to find out precisely what “goes wrong” and why. Other applications for the text analysis tool include checking your grant application for any gaps in topics you think should be covered, for checking your thesis development, or for lecturers to check their students’ use of references in submitted papers. Being able to visualise an entire collection in one display (and then dive into the content) can give one an idea of what is there before selecting which physical item to go to the trouble of visiting and retrieving. Whitelaw (2015) suggests that such “generous interfaces” can open up the reader to a broader, less prescriptive view into a collection than the traditional web search. It could be more useful to be able to compare different collections or publications against each other. This can be difficult when multiple licence holders or publishers are involved, with different technical or legal restrictions to address. Programming or other technical skills would need to be learned in order to develop or apply many tools. Alternatively, technical specialists would need to work in partnership with researchers, perhaps utilising the University’s Research IT service or the Library’s Digital Technologies & Services division. Digital or computational tools and techniques are increasingly being applied to arts, humanities and social science methods. Many of the collections at The University of Manchester Library have potential for stimulating interdisciplinary research. Such Digital Scholarship projects would often require a greater level of technical knowledge or skill than many research groups might currently possess, so further training or provision for technical support might be necessary. A new pilot workshop, the first Digital Humanities Library Lab, ran on 3 March 2017. 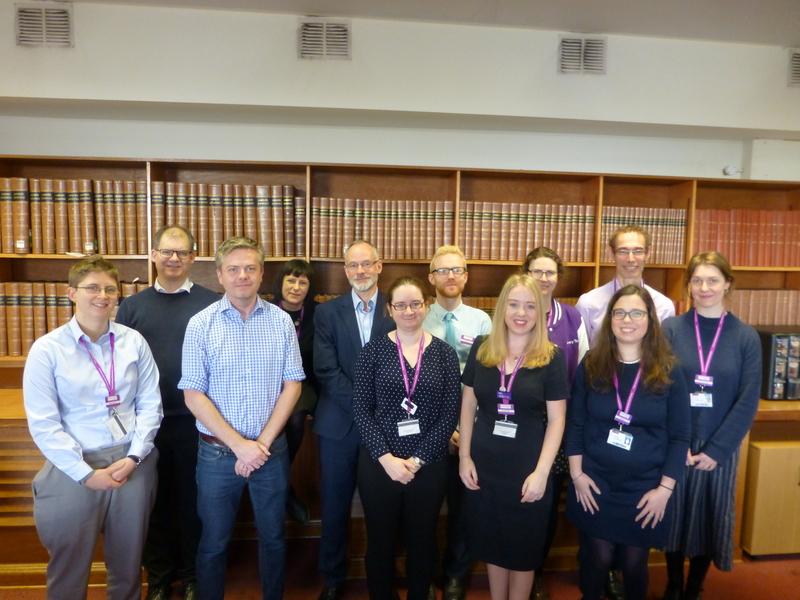 This engaging and informative cross-discipline event offered a dozen researchers the chance to explore and discuss new tools and digital text collections from The University of Manchester Library, inspiring the development of future Digital Humanities computational research methods. The afternoon comprised of three activities. The workshop instructions are available online for all to view, and the Library is looking to run a similar event again in May. What would you like to see covered next? Please get in touch with DH@Manchester or the Library’s DH Project Officer Phil Reed directly, or leave a comment below. cutting-edge research which can be developed in partnership with colleagues in the School of Computer Science (including text mining, linked data, image processing, and data visualization). The closing date is Wednesday, 22 March 2017. View the Project Call page for more information. 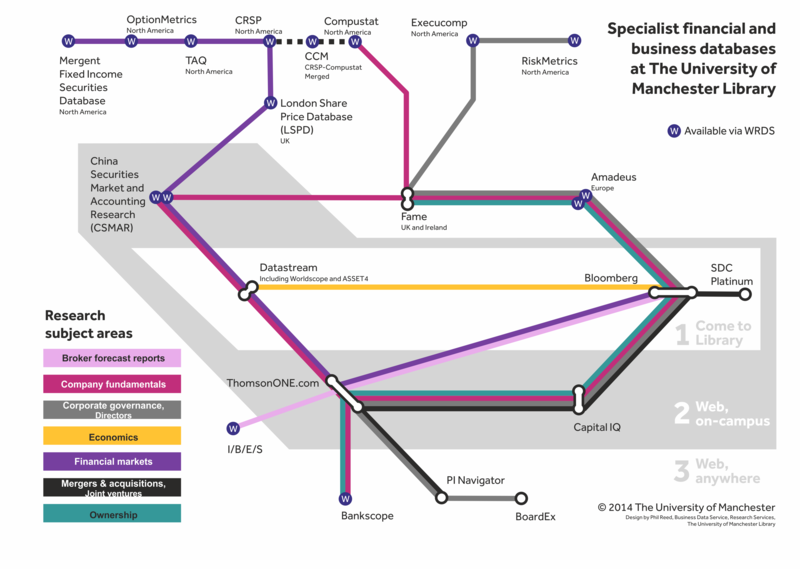 A technical prototype I developed for the Business Data Service has been used as the driving force behind a new and exciting research project post, bringing together partners from outside The University of Manchester Library. To develop a collection of tools to bring together commercially available databases from separate suppliers for use in leading, innovative research, using specialist knowledge of the field for accurate and efficient execution. Why is this new post useful? After spending money on expensive data sets, we need to make the most out of them. It is critical to use them together in order to unlock their full research value. In the case of some specialist resources, this activity is non-trivial. Why is joining these datasets difficult? There is no easy way to use the data from these different sources together, no common index. Identifying companies across different databases is difficult as the codes used within each platform usually do not correspond to those used in another. There are good reasons why a platform will do this (their intellectual property is one), but this makes work harder for researchers, sometimes resorting to checking company name matches by eye, one at a time! Writing code to map these where cross-checking is available requires the software developer to be aware of the various identification codes used such as CUSIP, ISIN, SEDOL and various ticker symbols, some of which can change with time or be further complicated in other ways. A close relationship to the curators of these databases at the University is required; this is found in the Library’s Business Data Service team whose expertise is well respected and appreciated by its users. As part of the project funding application, a new post was created. It sits outside the Library but is dependent on the library staff’s curating skills and knowledge of the library’s specialist financial databases. Under this post I will use my skills as a software developer and experience working in the Library to write new tools to combine access to various datasets within the project, as the products become available and as the researchers need them. I’ll still be working my usual job in the Library as well, so nothing is lost from the Business Data Service. The primary objective is to publishing new research on topics covering institutional investors, financial innovation and the “real economy”. Once the research is published, we can develop new teaching topics and further broaden access to the University’s data sets with these tools, introducing them to new audiences in other subject areas. I recently attended my first conference representing The University of Manchester, for the annual Business Librarians Association (BLA). It was a particularly good conference for a first-timer as the themes were interesting and relevant to most academic libraries across the country, not to mention the friendly and welcoming atmosphere from fellow delegates and sponsors. Many academic libraries are thinking about Customer Service Excellence (CSE) status, which The University of Manchester Library achieved in 2013. Helen Loughran from Leeds Metropolitan University (soon to be known as Leeds Beckett University) spoke about her experiences with her institution’s application, which is the largest university in the country to achieve accreditation so far. Are customers engaging with a library’s social media platforms, asking questions? If so, are there staff allocated and trained to answer these questions? Do all staff across the institution know who to pass online queries on to, including when received in error? When a customer has expressed dissatisfaction, should we consider inviting them in for a chat? Could we use a computer-aided text analysis program for determining the tone of free-text (typed words) feedback? There are many processes for qualitative data summation, but putting qualitative text data through a tool like Diction could give better analysis. How do librarians improve student employability? Can students articulate their graduate attributes? In addition to developing and offering excellent training, if we can help students to be able to explain why they studied and what it will enable them to do, this will ultimately improve their interview performance. Kaye Towlson from De Montfort University ran a breakout session titled How do librarians improve student employability? 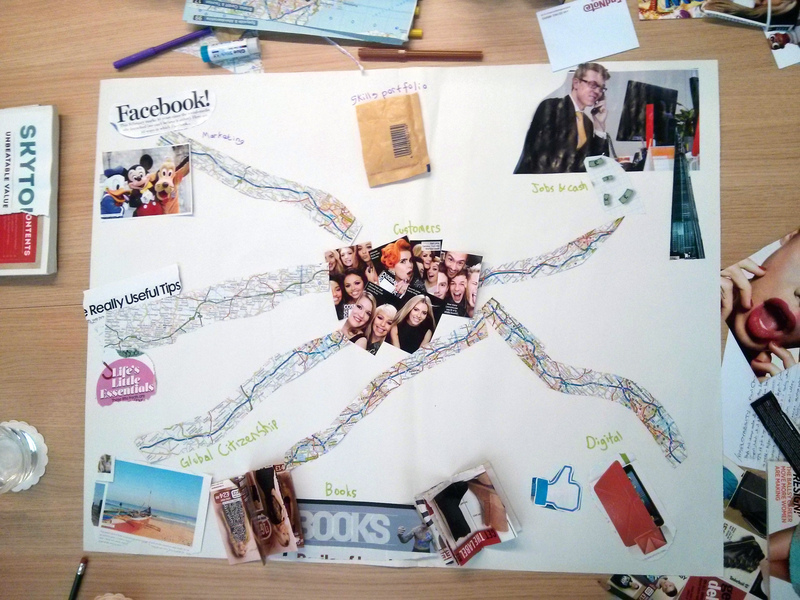 In groups, we produced an image-enhanced mind map to visualise a student’s journey through the library. Our group’s mind map (pictured) includes a customer-centric hub with spoke roads leading to books, social media, technology, skills portfolio, meeting spaces and global citizenship. Just because young people are mostly “tech-savvy”, this does not mean that they can “just do” academic research without guidance. Promote non-library specific expertise via non-library specific channels. This could include ensuring your content is searchable via Google, which is used must more than a library’s website as a starting point (much more). Ned also encouraged the use of direct, tailored and targeted communications to ensure the message about library value really hits home.